This is a stylish, modern looking storage chest that is capable of storing all of your small tools and equipment. Complete with a hinged lid and fitted propped arm, you are guaranteed easy access whenever you need it. Both the lid and the floor are created with resin bonded board solid sheeting for great durability. The lid is also covered with a high quality sand felt to protect it against the elements. You’ll also notice the roof has a gentle sloping design which prevents any water from building up and causing damage over time. 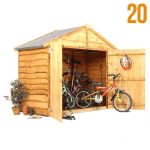 Whilst it is a small, compact storage facility, you’ll be surprised at the amount of things it can hold. You can store anything from pet food sacks to outdoor shoes and gardening equipment. 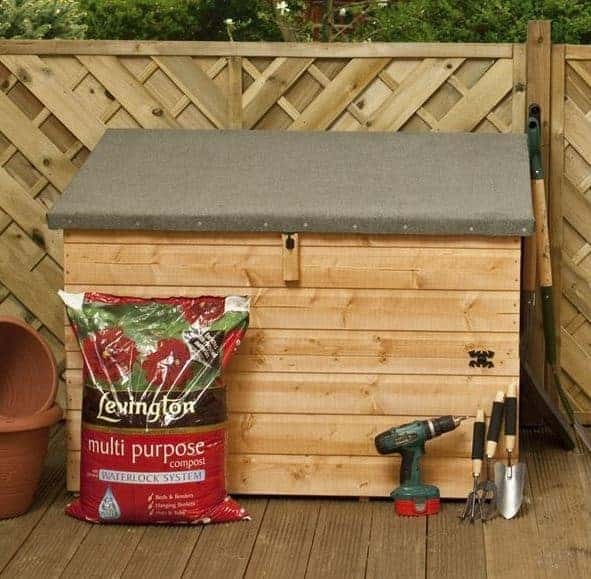 It is extremely useful in gardens and homes where there is very limited space available. The turn button lock also helps to keep the lid closed no matter how bad the weather gets. It can also help to keep small children out. However, it is unlikely to do much in the way of deterring thieves. So you will want to invest in a lock if security could be a concern. 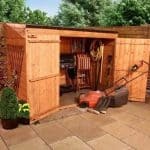 You might also like to see the top 10 4×3 shed currently on sale in the UK by visiting the WhatShed 4×3 shed awards league table. The unpainted style may not be to everyone’s preferences. However, you can paint it at a later date, or use a coloured treatment for a subtle change. 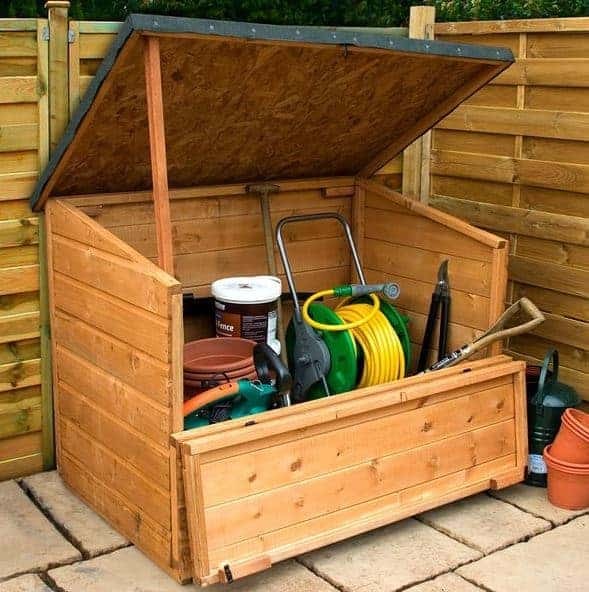 This is a small, compact wooden garden storage chest designed to hold all of your gardening bits and bobs. It benefits from a gentle sloping roof which ensures rainwater is quickly drained away. As it isn’t given the opportunity to collect on top of the unit, the risk of rot and damp related damage is significantly reduced. The roof is created with 8mm solid sheet materials and for added protection it is covered in a great heavy duty sand felt. To highlight its compact size, the chest measures 1.22m wide and 0.77m deep. It is taller at the back than it is around the front; measuring 3’1” tall around the back and 2’5” tall at the front. 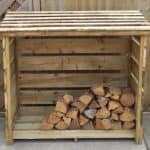 What’s really impressive with this storage chest is the fact it is constructed with Shiplap tongue and groove cladding. This gives it both a hardwearing design as well as a stylish appearance. 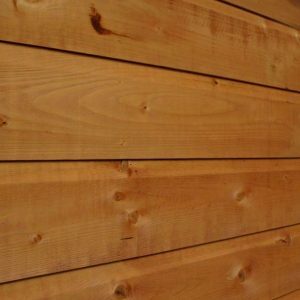 Shiplap is the most durable and highest quality type of cladding used on outdoor wooden buildings. So when you invest in this storage chest you know you are getting a great quality unit that will last for many years to come. The framing used on the chest measures 28mm x 28mm which is what you would find in a larger, wooden shed. This means it has a very sturdy, reliable design. A floor is included and it is made from 10mm solid sheet material. This means it is strong enough to hold medium weight storage. We do advise you to be cautious if placing heavy equipment and items in the chest as it may not be strong enough to support the weight. To solve this you can buy the extra strength support pack for the floor which will significantly improve its strength. A water based preservative is applied to the chest before shipment. This will only protect it from damage that could occur during the shipping process however. So you will need to use a high quality treatment after you have built the chest to ensure it is properly and adequately protected. Spirit treatments are the best option due to the extra level of water-resistance they provide. 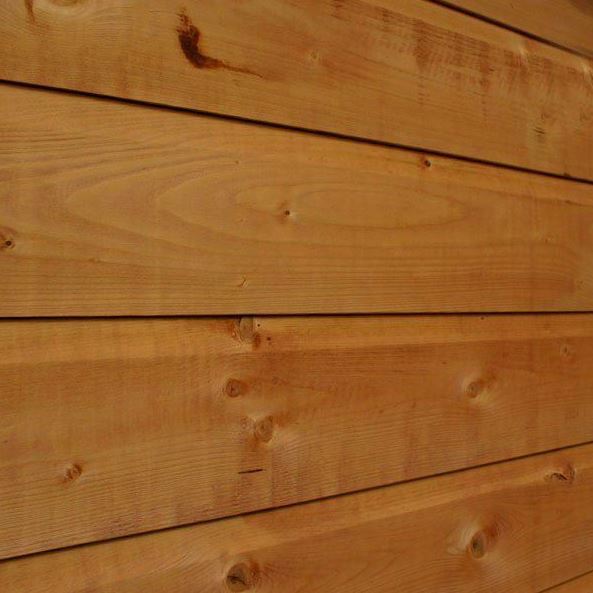 They work within the timber, as well as on the outside, to give it a more thorough water-resistant barrier. They aren’t available in many colour variations, but they will provide much longer protection than water ones so this is definitely something to think about. A free Golden Brown 5L treatment is supplied with the unit, so you don’t necessarily have to worry about treatment for the first year. This is a water based treatment but it has been resin enriched, meaning it offers a high level of protection. It also adds colour to the chest so this will please those who aren’t overly keen on the unpainted design. The good news is, if you do follow these treatment requirements, the unit will be covered by a 10 year anti-rot warranty. As this is a small storage chest, it doesn’t come with doors or windows. 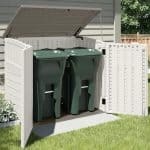 It does however come with a great quality lid with a propped up arm and you’ll also see from the picture that part of the front folds down to make it easier to access your storage. This is a very private and secure storage chest. Obviously as it has a completely closed design with no windows, whatever you store is kept out of public view. The only thing we do feel the need to highlight is that it doesn’t have an actual lock. The turn button lock is purely there to keep the lid from opening on its own. So it is recommended you buy a lock to ensure your storage is secure. Despite this being a very small storage unit, you still have a few extra options to choose from. The extra strength support pack is a good choice if you are concerned about the strength of the floor. However, you should be aware that although the included joists are easy to install, you may need to trim them first. This is because they come in 2350mm lengths. Fitting this support pack will give you that little extra peace of mind that the unit is capable of holding heavy objects. A superior duty felt is also available to improve the roof’s protection against the elements. This fibreglass felt is self-adhesive and comes in a Charcoal colour. It’s worth mentioning that the heavy duty felt which comes with the storage chest is actually very durable. 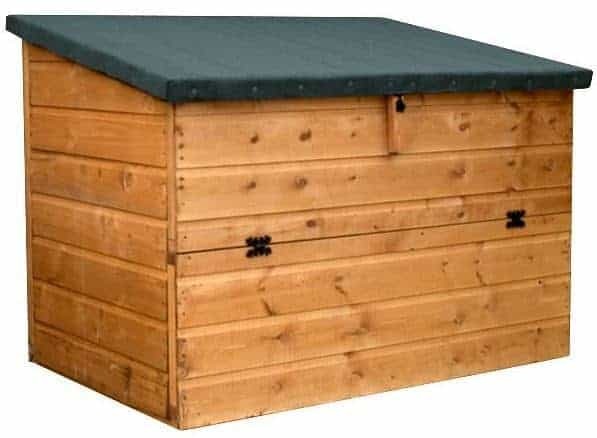 So again, this is an extra that is designed to mainly give you peace of mind and it will extend the longevity of the roof which is always an advantage. Perhaps the main extra we feel will prove the most beneficial is the 49mm padlock. This completely weatherproof padlock is delivered with a hasp and staple and it will dramatically improve the chest’s security. This small extra is packed with massive benefits such as a protected hardened steel chrome plated shackle, Thermoplastic weatherproof jacket and an incredible double locking mechanism. Compared to other storage chests out there, this one boasts an extraordinary design. It’s created with high quality timber and not only functions well, but also looks great too. Overall the materials used to create this chest come with fantastic durability. The only thing to note with this chest is if you don’t upgrade the floor and you store heavy items, over time it will start to sag. Obviously due to its compact size, this isn’t going to provide you with a huge amount of storage space. 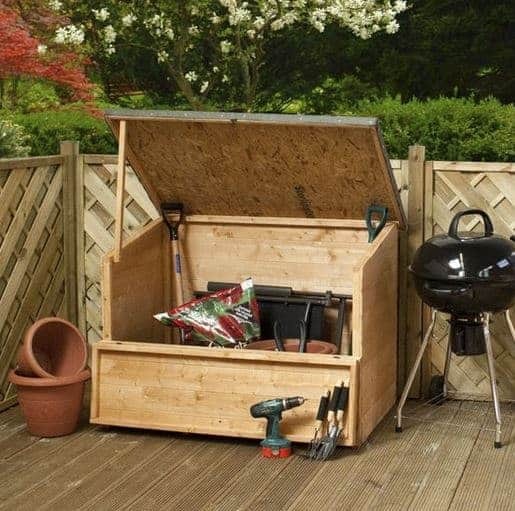 It is created to hold a very small amount of general gardening and outdoor equipment. You shouldn’t come across any issues with the installation of this unit. It is quick and easy to assemble and Waltons have made the instructions very clear to understand. 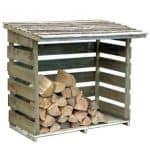 This chest offers excellent value for money. Another benefit of its small size is the fact that the treatments required are quick and easy to apply. A tub of treatment will also last a lot longer than it would with a larger building. Final Thoughts: When you’re short of outdoor space, this great wooden garden chest provides a fantastic storage solution. Compact yet big enough to store everything from outdoor shoes and gardening tools, to sacks of pet food; it comes with some pretty great features. We really like the way the lid has been designed. Complete with a propped arm, getting things in and out of the chest is simple. It boasts an incredibly long-lasting design and will look great in any garden. Due to its compact size it is also really easy to assemble. There are also a number of upgrades available to help you get even more from this great storage chest.